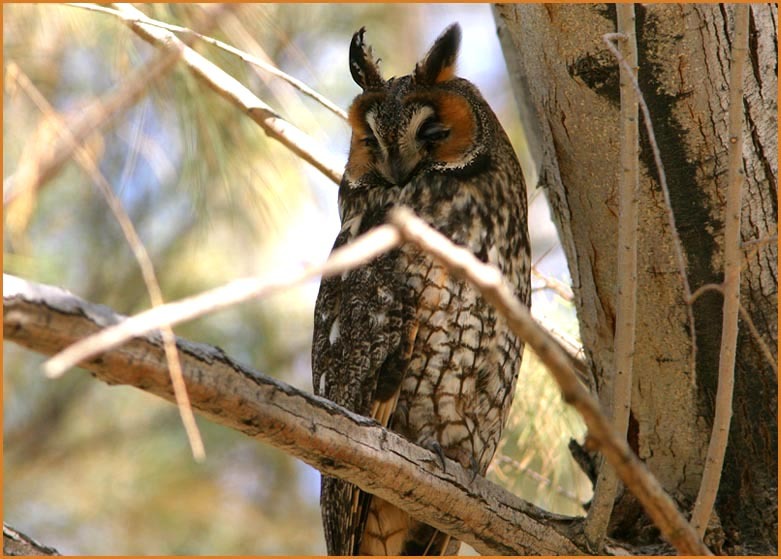 For Fresno County the headline photo is of a roosting Long-eared Owl at Mercey Hot Springs in the extreme northwestern corner of the county. The resort has a few planted tamarisks in otherwise open grassy undulating plains, and each winter up to two dozen of these mysterious owls roost here ["mysterious" because we know comparatively little about the ecology of this species in California]. I find them exceptionally beautiful, and the warm colors of the roost trees add to the effect. I sacrificed the tail of the owl to get this horizontal close-up shot, but the vertical images are equally dramatic. The one below (left) shows this same owl in a posture that makes it as slim and 'inconspicuous' as possible. Birders interested in seeing these owls have so swamped this little resort that there is now a $5 per person fee just to birdwatch here [this also means the resort owners do what they can to product these owls]. In the nearby Panoche Hills — BLM land now open to the public — I photographed this very attractive Lark Sparrow (below right). Ironically, there was a wintering Sage Thrasher in the bush just beyond it. It is just serendipitous that all three photos here are from the arid western foothills of Fresno County. I've had great times birding in the Sierra portion of the county as well, including Kings Canyon itself, and the fine montane forests along Dinkey Creek Road, near Shaver Lake.